Alex Porteous was fishing a 65kg Dropper Rig on Anzac day at Muriwai Beach. Alex set 10 hooks baited with fresh mullet and left the gear to fish for half an hour. He caught seven large gurnard from the 10 hook set. Shane Mankelow was kitefishing with a longline rig about two kilometers north of the creek at Muriwai Beach just over two weeks ago. Shane and his mates ran one set which returned two 6 lb snapper and two gurnard. They then moved to north of the Rimmer Road access and ran another two sets. Their total catch for the day was 35 snapper and six gurnard off the three sets. Shane reported that he saw another kitefisher just north of him pull in a 16 lb snapper and a little further up the beach a kitefisher with a 10 lb snapper. He reports that every kitefisher they passed on the day was catching plenty. Doug Bassett has been kitefishing every possible weekend for the past 5 months using a 65kg Dropper Rig. Last week while fishing at Porangahau Doug set 10 hooks baited with salted Kahawai. The winds went from a moderate 20 knots to howling gusts between 60 and 70 knots, the kind of conditions where the sand is lifted off the beach and blown straight into your face like stinging needles. Doug's previous kite dropper rig catches include two snapper of 25 and 30lbs at Easter and a 20 pounder a couple of weeks earlier. 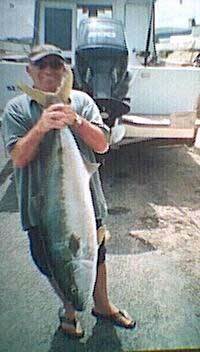 Harry Job called in at the motel with this 21lb snapper. Harry took the snapper on a nighthawk kite powered longline rig at Porangahau Beach and he was very happy with his catch. There was only one Kite out on the previous Saturday and from what I could see they caught a few fish. Someone also fished the next day with a longline and caught a nice 18lb snapper and a lemon fish . John Potham has a digital camera and is prepared to photograph your catch at his motel at Porangahau Beach. So if your fishing Porangahau Beach area drop in and get your catch recorded and we will post the photo in this newsletter. John's motel is on the beach and he can see the whole 16 km of beach right up to Blackhead Point from their place so they are really in touch with what is happening on the beach. If anyone wants to know what the conditions are like on the day before heading out to the beach, just give John a ring on 06 8555112. John also has a full fishing tackle store at the motel and stocks Kite Fishing Rigs, Fishing Kites and a comprehensive range of fishing kite accessories. Ian is a keen kite fisherman and spends the time to check out other beaches around the area. As he was passing Orewa Beach he decided to stop and check out what was being caught from the kites that were set. Using a Bottom Longline a couple of fishermen hauled in 12 snapper on one set while Ian was watching. Excitement levels are high in the MacDonald household while Ian waits for more of the same weather we had last weekend. Reports suggest the snapper are still out on the west coast but they do seem to be thinning out a bit. Anzac Day was a good day for the westies to get their gear out so Ian went to see what was happening. 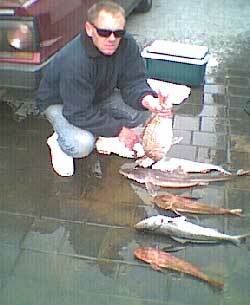 Port Waikato was producing kahawai, snapper and gurnard. Ian was pleasantly surprised at the gurnard coming in; he says they were the biggest gurnard he has ever seen. There were 7 if not 8 of them on one set, so good news there for our west coasters. The best news of the week has to be that Uretiti Beach is now clear of the red sack weed. Reports coming from Pakiri Beach to Uretiti Beach during the week all indicate the red sack weed is dissipating. Good fish are being caught and the weed is not causing any problems in most of the area. The weed that was around Te Arai Point has disappeared as well so things are looking positive for this weekend coming. The weed does not seem to have disappeared completely, Waipu is infested with the weed now, but hopefully this won't last for too long. Any fishermen going up that way please let us know what it is like up there. Send your info to Fishing Reports. Any information you can give us is helpful. Our newsletters are sent to you on a Friday afternoon so you can plan your weekend's fishing trip. Make sure you don't do what one kitefisher admitted to me in the shop last week. This chap is a very keen kite fisher, but understandably wishes to remain anonymous on this occasion. He set his gear out off Uretiti Beach and had a huge struggle retrieving his longline rig due to the masses of sack weed around the line. The funny part was, on arriving at home decided he was too tired to do anything else but sit down in front of his computer and read the newsletter from Paul's Fishing Kites. In the newsletter he found all the warnings about the sack weed off Uretiti Beach and the advice not to go there! He promises to read the newsletters before he goes fishing next time. Fishing seems to be going very well for boat fishers around the Whangarei area. 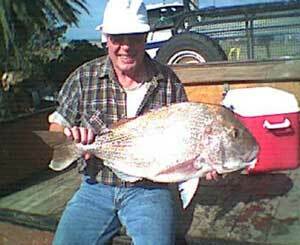 Warren Hay from Dargaville Marine reports there are plenty of snapper, gurnard and trevally around. The best areas are close in off Ruakaka and Ocean Beach in particular. Both spots are producing good fish. This is great news for the upcoming weekend. Kitefishers could do well in these areas if the westerlies hold out over the weekend. Don't go to Waipu though, it may need a couple of weeks yet for the last of the weed to clear. Due to the popularity of kitefishing there are a lot more kites being flown from the beaches. Please be considerate when going fishing on the beach when others already have their gear set. Leave a good 500m between you and the next kitefisher. This will help prevent any tangles and make your day and theirs a much more pleasant experience. The club is holding a non-fishing, kite-flying day at The Esplanade, Mangere on Sunday May 19th 2002 starting at 11am. This is a particularly good day for those fairly new to kite fishing, as it is an excellent way to pick up some helpful tips. Even those that have been kitefishing for a long time say there is always something to be learnt from the others in the club. Club members will be flying their kites, demonstrating how to tack the kites and retrieve them. All good information, and a fun day for everyone. This newsletter depends almost entirely on it's subscribers for the fishing reports we post, the more subscribers we have the more comprehensive the fishing newsletter will become. We hope to grow the fishing report newsletter subscriber numbers into the thousands so that we can give good coverage to all areas around New Zealand and cover more methods such as surfcasting and fishing from boats with rods or longlines. If you already enjoy the newsletter or want more coverage of your area you can help by simply letting your mates know about this newsletter. You can help us make this a great newsletter by sending in your fishing reports to Fishing Reports Please include your name, where and when you were fishing, rig or method you use, wind conditions, bait and what you caught. It is also important to know where the fish are not biting so even if you catch little or nothing send the report in. This helps everyone maximise their fishing time and makes it that much more enjoyable for all of us.